The presentation took place at VINLECâs Paulâs Avenue headquarters. In taking the top prize, VINLEC defeated the 2011 winners, Bank of SVG All Stars in the final on October 10, under the lights at the Arnos Vale Netball Complex. 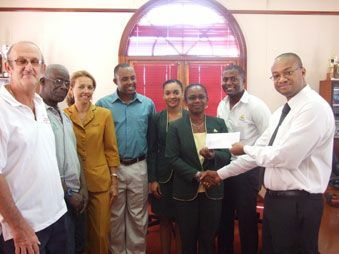 In handing over the cheque, president of the club Grenville Williams said plans are in train to âre-energise the competitionâ in 2013, as they go in search of getting more teams to participate, while keeping the âfun and camaraderieâ as the major objectives. Williams said the annual event, which is supported by several firms and statutory bodies, is part of the clubâs fund-raising ventures. He said among the programmes carried out by the club with the funds generated from the softball competition are the World Paediatric Project; the annual childrenâs Christmas party, which will take place in West St George this year; and their regular contributions to the Lewis Punnett home.